Zinc Oxide, Set of 4. P/N ALL-54166 This dual throttle return spring kits consist of two springs. 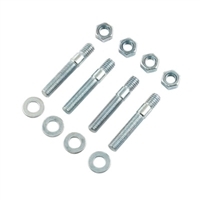 P/N ALL-54163 This Long throttle return spring kit consist of two springs. Mounting Bracket for your 4150 series Holley Carburetor. Stamped Steel and then chrome plated.